Today was one of those days of realizing just how far along in life we are. Attended the service for Mr. Doran, a good teacher from high school. An outstanding teacher from high school. He is the reason I even remember any part of the Robert Frost poem I quote in the title. Much of the details of what I learned in his classes are lost in the haze of time in my brain, but I believe that time spent helped formed what I am today. He is forever Mr. Doran to me and so it came as a bit of a shock to hear of his passing. In my mind I see him as I knew him in high school, so this was a wake up call that time waits for no one. Mr. Doran, I hope you rest well knowing that you have been a positive influence on so many in this soceity, that your life’s endeavor as an educator was not for naught. The world has lost a valuable asset, for without education, we fall into chaos. Mr. Doran, you have kept your promises, and done your miles, it is now time for your sleep. 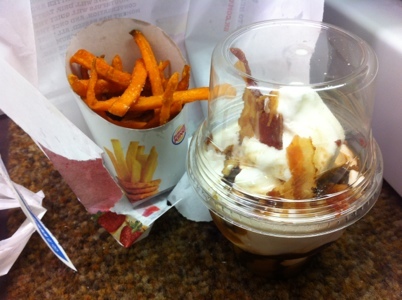 I had to do it, got the Burger King bacon sundae as a desert with my lunch yesterday. Basically a vanilla sundae with chocolate and caramel syrup and bacon bits and strip of bacon garnish. No wussy kosher vegan bacon like flavoring, honest to goodness real pork goodness here! So the verdict? It’s a gimmick. It’s actually not bad at all, but on the other hand it’s not something I’d go out of my way for. BK has stepped things up with a revamp of menu, and the other thing I tried and do like are the sweet potato fries. Maybe behind the times for all you hip bar flys, but pretty cool to find at a mainstream fast food joint. OK, I try not to go into rants on traffic because it’s pointless and never ending, but I’ll get it all out today, it having been an especially horrid Friday, even though traffic wasn’t that bad. Actually this isn’t about traffic, it’s about idiot drivers. First and foremost, the title of this post. It sure seems people think otherwise though, I had red light runners at two consequtive intersections! My other top peeve that I’m sure I’ve posted before about is, the solution to gridlock is NOT to make your way into the intersection to make sure you don’t have to wait a light cycle since your already in the intersection. Who cares about the traffic backing into the freeway even though the through lane you are blocking is clear for an entire block past you! Well, as per GoPro website and the usual first fix for anything computer related, I “rebooted” the GoPro and the WiFi Back. I’m not sure if that fixed anything but I did a little test by putting the camera on the roof of car outside then going for a walk down the street. To get the advertised range of 200 yards, you need to have a totally clear line of sight. I actually was able to go out to past 300 yards and still get spotty control. But once you get things in the way, signal is drastically affected. With the camera in my room I totally loose signal by the time I reach the end of the garage, perhaps 20 yards. Single wall redwood tongue & groove construction house. I’ll have to see if the reboot will help out at the rally cross site. The site is open dirt, but with Jersey barriers in areas. There were times when I couldn’t get 10 yard range. I wonder if there was some kind of electrical interference going on, maybe the spooks, or Pearl, or aliens. Oh, and another thing, the open air cutout extension back seems to reduce sound sensitivity more than the regular open back. Hopefully they get Bluetooth working for external mic, there actually is an icon for it now in the camera setting, but it doesn’t do anything currently. Although that’ll be yet more battery drain. It sounds like everything will be OK, but I really shouldn’t think or say that, since that will doom everything to failure. The inbound flight is on (delayed) schedule and should be on the ground soon. 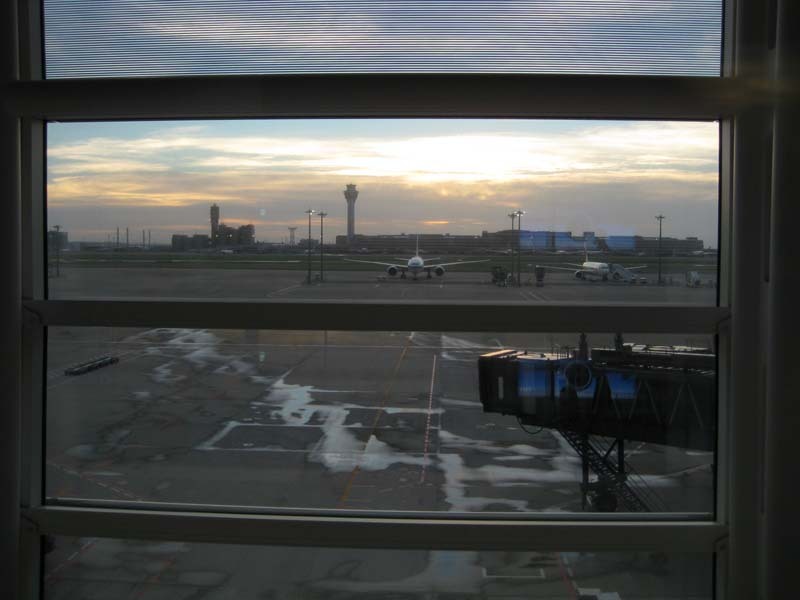 The Delta and Thai Airlines flights that were delayed in leaving here last night are loading up to leave, so the wind conditions are apparently OK for takeoff. It’s still too early, so I haven’t seen any inbound landings on the runway yet. From the TV news, it looks like the typhoon center is up near Miyagi and Sendai now, and heading out to sea – Hokkaido might miss most of the brunt. Two – actually three if I count dinner – beers later, I’ve got a pretty rocking headache. 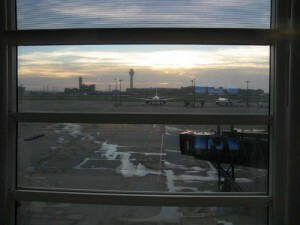 Being homeless in the airport terminal doesn’t help I guess… Pocari Sweat to the rescue! 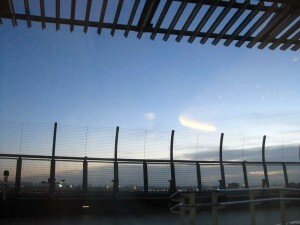 The wind and rain peaked out between midnight and 01:00. There was some dude downstairs out by the highway in the whipping rain with an umbrella during the worst of it. I’m not sure if he was a curiosity seeker, was actually headed somewhere, or was just an idiot. The rain has stopped, and the sidewalks outside and the window glass are now dry. The wind however is still ripping, so the inbound flight is not going to have an easy time. I was thinking I’d head through immigration and go to the gate, but if I do that and the plane gets diverted, I’ll be up the creek. At least if I stay on this side, they can get me a hotel if push comes to shove. 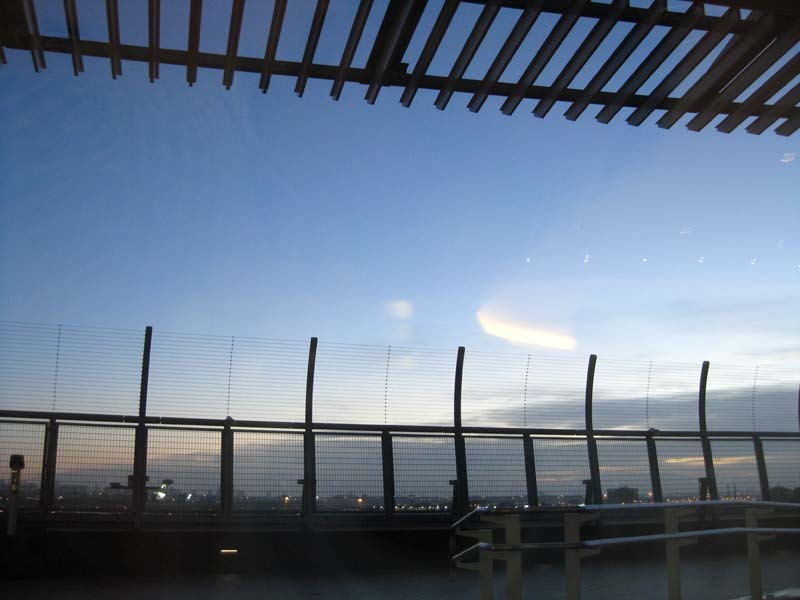 Once I “leave Japan” and pass through immigration, it’s all over. 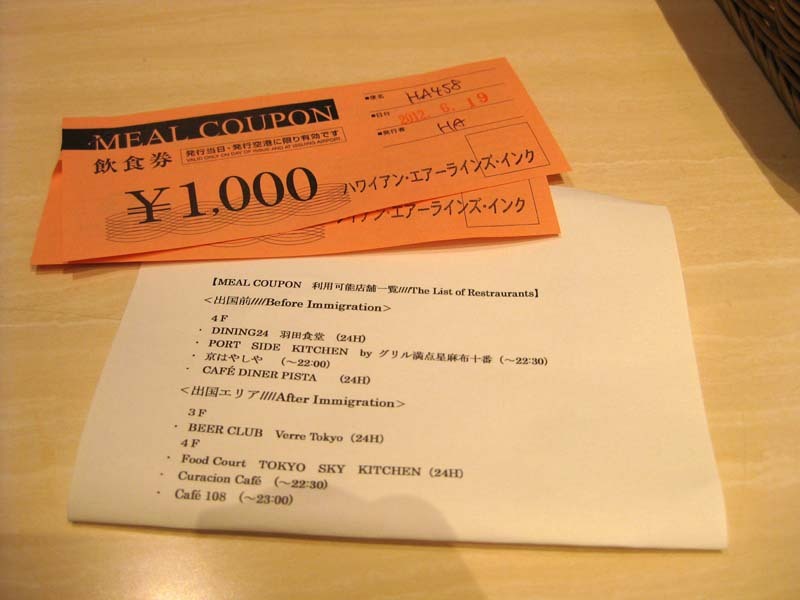 So I didn’t score a hotel room for the night, but I got the next best thing – 2,000-yen in meal coupons. It sucked a little that they were only good for a few places, and they were given to me after 21:00, when a lot of the places that actually remain open after 21:00 are moving to a more limited menu. 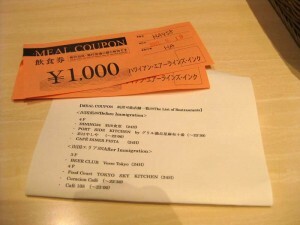 I went by the pre-immigration 24-hour restaurant and got a beer, some assorted sausages, and a tsukudani nigiri. About the time my food arrived, they switched to the limited menu, so I couldn’t get dessert. No problem: I ordered another beer! While on the subject of security gurads in Japan, I was approached in English by an older gentleman at Meiji Jingu who told me, “no photography”. I was standing on the top step of the altar area where you give your offering, but on the stairway side, taking a picture of the shrine courtyard – opposite the sacred inner-sanctum (It’s pretty obvious to me to not be a cultural boor and take a picture of the sacred areas). He pointed at the one step down from the top. I stepped down one level and he walked away. Essentially, if I wasn’t on the top step, I was out of his jurisdiction and responsibility, and I could go and do whatever I pleased and he didn’t care. This is the kind of compartmentalized thinking that leads to nuclear powerplants melting down. There’s a security guard here that has been by a couple of times since I’ve been sitting here. He has gone to the window to look to see that nothing has been placed between a partition wall and the glass and opened the recycling bins. Not exactly sure what he’s actually been trained to look for, but there’s a bottle half full of fluid a couple of rows of seats behind me that has been there since three that he still hasn’t noticed. I feel really safe. This is totally “three-ring binder” security – he was given explicit instructions of specifically what to look for and where, and anything outside that scope, although potentially a threat, gets ignored. He’s totally following “the rules” and not actually “doing the job” and providing security.